The 4A Great Basin Conference prep baseball and softball leagues announced their 2014 All-Conference teams last week following the May 17 completion of the 4A state tourneys. Hailey’s Wood River High School put two players on the first teams—junior Ciceley Peavey as catcher in softball and senior Finn Isaacson as pitcher in baseball. A second-teamer last year, Isaacson (3-3 as Hailey’s pitching ace) led the Wolverines to a much-improved 10-12 season record including a 6-5 homefield mark and a GBC tournament win over the Canyon Ridge Riverhawks. Peavey, a Great Basin honorable mention pick last year, batted .329 for the season with 27 hits and 30 runs scored. She ranks ninth overall on the all-time Wood River on-base percentage list at .405. She was a workhorse leading Hailey to a 16-9 record behind the plate. Underclassmen from Wood River on GBC second teams were senior Shelby Cooper (infield); juniors Cameron Benson (catcher), Brittney Bradley (pitcher), Lacy Harrington (outfield) and Ashley Hicks (designated hitter); and sophomore Reide Whitehead (DH). Making honorable mention from Wood River were senior Cassidy Cooper, sophomore Adrian Rojas and freshman Blair Radford. Dominating the selections were State 4A baseball and softball championship teams from Twin Falls High School. The Twin Falls boys won their second state baseball title in four years 4-1 over Lakeland of Rathdrum. The Twin Falls girls captured their first-ever state title with a 26-2 season record including 4-0 and a 40-9 scoring advantage at state. Coach of the Year—Tim Stadelmeir (Twin Falls). Player of the Year—Danny Freiburger (Minico junior). Pitcher of the Year—Dom Baker (Jerome senior). Catcher—First team: Tanner Harper (Minico junior). Second team: Cameron Benson (Wood River junior). Pitchers—First team: Kaleb Jones (Twin Falls junior), Chandler Greenfield (Twin Falls junior) and Finn Isaacson (Wood River senior). Second team: Gaige Kepner (Canyon Ridge senior), Braden Stutzman (Twin Falls junior) and Ethan Bragg (Jerome senior). First base—First team: Hunter Breshears (Burley senior). Second team: Mateo Arteaga (Burley junior). 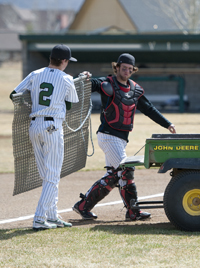 Second base—First team: Tyler Walters (Twin Falls senior). Second team: Trever Ostler (Jerome junior). Third base—First team: Austin Bobrowski (Jerome senior). Second team: Austin Frank (Minico sophomore). Shortstop—First team: Braden Stutzman (Twin Falls junior). Second team: Mario Del Bosque (Burley junior). Outfield—First team: Ethan Bragg (Jerome senior), Sterling Duggan (Twin Falls senior) and Michael Cantrell (Minico junior). Second team: R.J. Neveraz (Burley senior), Treyson Thomas (Jerome senior) and Braden Griffith (Canyon Ridge senior). Designated hitter—First team: Zach Thibault (Jerome senior). Second team: Reide Whitehead (Wood River sophomore). Utility—First team: Tyler Rojas (Canyon Ridge junior). Second team: Chris Chapman (Canyon Ridge junior). Honorable mention—Adrian Rojas (Wood River sophomore); Richard Hall (Jerome senior); Wyatt Doyle (Twin Falls senior) and Aaron Brann (Twin Falls freshman); Gunner Gridley (Jerome senior) and Nathan Suitter (Jerome senior); and Davis Gibbons (Burley sophomore). Coach of the Year—Jessica Pistole (Twin Falls) for a second straight year. Player of the Year—Cortney Nolan (Twin Falls senior). Pitcher of the Year—Rainey Dyreson (Twin Falls senior). Catcher—First team: Ciceley Peavey (Wood River junior). Second team: Jenna Gray (Canyon Ridge freshman). Pitcher—First team: Megan Hinojos (Twin Falls senior). Second team: Brittney Bradley (WRHS junior). Infield—First team: Brooke Swafford, Skylar Call and Jordan Henley (Twin Falls sophomores), and Jessica Praegitzer (Jerome senior). Second team: Shelby Cooper (Wood River senior), Keeley-Shea Salazar (Minico sophomore), Kassadie Brooks (Canyon Ridge freshman) and Lynsey Hudelson (Canyon Ridge sophomore). Outfield—First team: Courtney Ellis and Makenzie Swafford (Twin Falls seniors), and Tayla Sayer (Minico freshman). Second team: Lacy Harrington (Wood River junior), Taylor Deboard (Twin Falls senior) and Maddie Bauman (Canyon Ridge freshman). Designated hitter—First team: Morgan Harshbarger (Twin Falls senior). Second team: Ashley Hicks (Wood River junior). Utility—First team: Kayler Detmer (Canyon Ridge sophomore). Second team: Taylor Harrison (Jerome sophomore). Honorable mention—Blair Radford (Wood River freshman) and Cassidy Cooper (Wood River senior); Bailey Somerset (Jerome sophomore); Katie Tolbert and Samantha Beverly (Canyon Ridge freshmen); Jayme Schenk and Danica Asher (Burley seniors), and Zoe Ferrin (Burley junior).